ComicsFix – the subscription-based digital comics service available on iPad, iPhone, Android devices and online – is proud to announce a new partnership with award-winning comic book publisher Valiant Entertainment to bring select Valiant titles to ComicsFix’s digital comics library. Effective today, comic book fans can join ComicsFix’s monthly subscription plan for access to select series including X-O Manowar, Archer & Armstrong, Harbinger, and more of Valiant’s critically acclaimed superhero titles. The first wave of Valiant titles on ComicsFix is available now, featuring the origins and initial adventures of Valiant’s most popular series – including X-O Manowar Vol. 1: By the Sword by New York Times best-selling writer Robert Venditti (The Flash, Green Lantern) and Eisner Award-winning artist Cary Nord (Conan); X-O Manowar Vol. 2: Enter Ninjak by Venditti and artist Lee Garbett (Batman & Robin); Harbinger Vol. 1: Omega Rising by New York Times best-selling writer Joshua Dysart (Unknown Soldier) and Harvey Award-nominated artist Khari Evans (Carbon Grey); Bloodshot Vol. 1: Setting the World on Fire by writer Duane Swierczynski (Judge Dredd) and artists Manuel Garcia (Black Panther) and Arturo Lozzi (Ghost Rider); Archer & Armstrong Vol. 1: The Michelangelo Code by New York Times best-selling writer Fred Van Lente (Marvel Zombies) and Clayton Henry (Uncanny X-Men); and Shadowman Vol. 1: Birth Rites by Harvey Award-nominated writer Justin Jordan (The Strange Talent of Luther Strode) and artist Patrick Zircher (Iron Man). In addition to these best-selling titles, new additions from Valiant’s critically acclaimed library of comic books and graphic novels will be added to ComicsFix monthly. 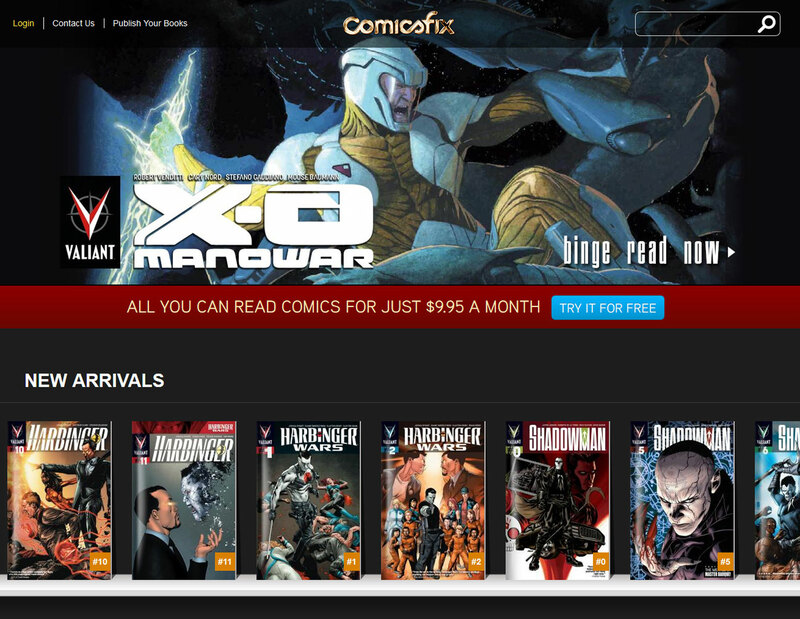 Old and new readers alike can look forward to a near-constant influx of top-notch content from Valiant on ComicsFix’s innovative digital reading platform. Founded in September 2013, ComicsFix is a low monthly fee, subscription-based digital model that allows readers access to unlimited top-quality comics. ComicsFix’s versatile and ever-expanding library includes titles from Valiant Entertainment, Dynamite Entertainment, Alterna Comics Inc., Markosia, Asylum Press and hundreds of independent creators and publishers, resulting in thousands of comics available for subscribers on their iPads, iPhones, Android devices, desktops and laptops. ComicsFix is known for their no-hassle approach for their publishers and creators. The creator-friendly and progressive company is driven in establishing relationships with writers and artists around the world. ComicsFix is also praised for their attention to their users while maintaining high quality comics. They can be found online at ComicsFix.com.